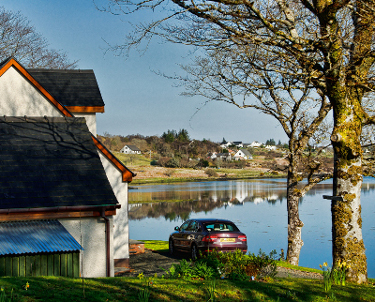 Two ensuite rooms are offered both on the upper floor with super views over the loch. Each room has tea and coffee making facilities and televisions.....if you get bored with the view! Red Skye has a bath with shower, Blue Skye has an ensuite with powerful shower. Guests can also relax in the lounge where, should the evening turn chilly, a welcoming log burning stove and a collection of books is to be found. Breakfast is served in the dining kitchen. Guests can help themselves to a variety of cereals, fruits and yoghurt. Toast, tea or coffee is also provided. Additionally sliced cheeses and cold meats are served. The Skeabost Country House Hotel is a short walk from the house where guests can eat in the dining room or bar area, or just pop in for a casual drink. There is also a nine hole golf course.